Stretchy Shawl with Metallic Threads Stretchy long shawl with metallic threads and fringe. 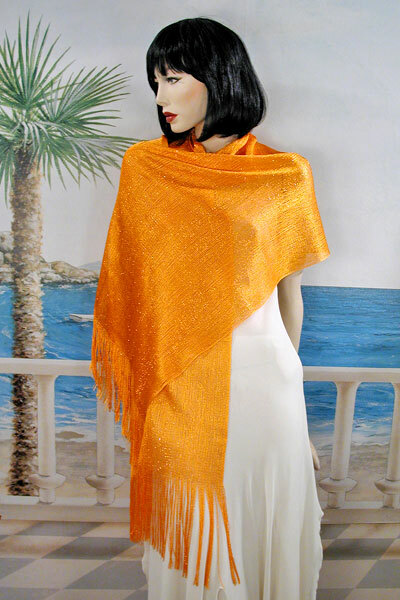 This lovely shawl works well for day or evening. It has just the right touch of glitz and has enough stretch to drape well. It may be worn tied in the front, draped over one shoulder or secured with a pin or clip. It is versatile and can be worn with an daytime outfit for a little splash of color and warmth or for evening as an accent and wrap for a special dress. It is available in a wide range of colors. Color: orange Hue: Code: #FF9900.